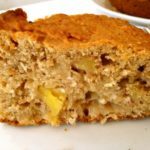 Pineapple, coconut and banana cake – This delicious cake is gluten-free, dairy free and has no refined sugar. It’s a delicious blend of coconut, pineapple and banana, just like a Pina Colada, so no added sugars or flavours are needed! – medjool dates, gluten Free Self-Raising flour (or 150 grams gluten free mix and 100 grams buckwheat flour if you prefer). If not using self-raising add 2 tsp baking powder, ripe bananas mashed, fresh pineapple diced (frozen is fine), cinnamon, shredded coconut, coconut oil, chopped walnuts, honey or maple syrup, chia seeds (soaked in 1 tablespoon water) or use 2 eggs if you prefer, Pre-heat oven to 180 degrees Celsius. ; In a food processor (or blender) blend together the dates, chia seeds (or eggs), honey and coconut oil. ; Add this mixture to all of the other ingredients and stir gently. ; Pour into a round cake pan that has been oiled and lined with greaseproof paper. ; Bake for about 45 minutes or until a skewer inserted into the centre comes out clean. ; Leave in the pan for 10 minutes, then turn out onto a cooling rack. ; – This cake is quite dense so it will not rise a lot. Serve with a warming cup of <a href="http://theclever.kitchen/recipe/spicy-chocolate-chaga-drink/">Spicy Chocolate Chaga</a> for a delicious afternoon break. This delicious cake is gluten-free, dairy free and has no refined sugar. It’s a delicious blend of coconut, pineapple and banana, just like a Pina Colada, so no added sugars or flavours are needed! In a food processor (or blender) blend together the dates, chia seeds (or eggs), honey and coconut oil. Add this mixture to all of the other ingredients and stir gently. Pour into a round cake pan that has been oiled and lined with greaseproof paper. Bake for about 45 minutes or until a skewer inserted into the centre comes out clean. Leave in the pan for 10 minutes, then turn out onto a cooling rack. This cake is quite dense so it will not rise a lot. Serve with a warming cup of Spicy Chocolate Chaga for a delicious afternoon break.